Snoring affects so many people that it’s almost considered an inevitable body function, similar to sneezing or yawning. Truth is, snoring is completely avoidable. It just takes the right kind of treatment. That doesn’t even include the issues that it causes between couples. Bed partners of people who snore often report a decreased desire for intimacy and, in some cases, resentment towards their snoring partners. Thankfully, some anti snoring mouthpieces have a very high success rate. The important thing to keep in mind is that not all mouths are created equal- anti snoring mouthpieces will fit people differently. The perfect mouthpiece for one person might not work quite as well for another. However, there are still certain mouthpieces that are considered overall better and more effective than most others. Because of that, I have compiled this list of the seven best anti snoring mouthpieces that you can buy in 2017. But, before I start my list, I present the following disclaimer: the effectiveness of anti-snoring devices varies depending on dental structure. People with a crossbite, for example, may find most anti snoring devices to be a pain. Additionally, if you’re prone to jaw soreness, anti snoring devices will almost always worsen the soreness. Use at your own discretion and feel free to contact me for any questions. 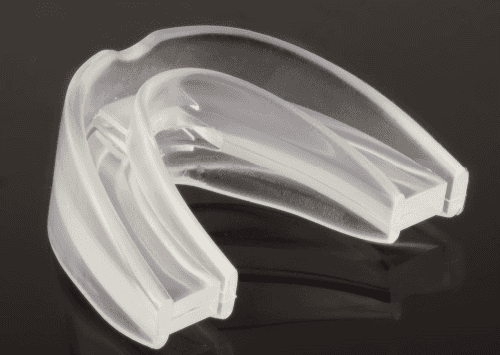 The SnoreRx has some pretty clever features that most anti snoring mouthpieces don’t. My favorite is the Flex Jaw design, which lets you adjust the jaw of the mouthpiece on 10mm increments to whatever position you like. This makes it much easier to find the perfect fit. One of my biggest requirements for Mandibular Advancing Devices (MADs) (or anything else that I put in my mouth) is that it not be toxic. SnoreRx gets the green light here because it contains zero BPA, latex, or acrylic; it’s made up of only medical grade materials. So you can rest assured that you won’t have any chemicals leeching into your mouth. The mouthpiece has cushioning in the lower and upper jaw areas which help with help make the mouthpiece feel more comfortable. Like most mouthpieces, the SnoreRX might cause a bit of jaw soreness during the first few nights. But the soreness usually stops after the 2nd to 4th day. 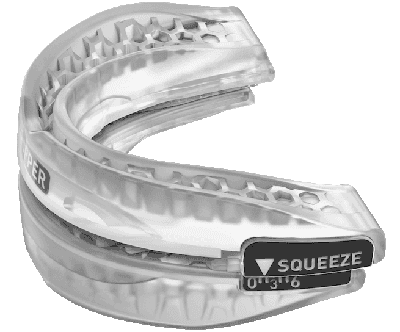 Overall, the SnoreRx is one of the best anti snoring mouthpieces in the market as of 2017. The ZQuiet takes a different approach to anti snoring mouthpieces. Unlike most, if not all mouthpieces I’ve tried and seen before, this mouthpiece can be opened and closed while being worn. This is, quite possibly, the only mouthpiece that you can drink water and talk with! As if that wasn’t unusual enough, the ZQuiet is advertised as a one size fits all device. In the case that the mouthpiece is too large, it includes instructions to shorten the mouthpiece up for a better fit. This mouthpiece fitting approach is preferred by a lot of people over the common boil and bite approach to mouthpiece fitting. Just like the SnoreRx, the ZQuiet is made from medical grade materials and is FDA cleared, which means you don’t have to worry about the mouthpiece posing a choking hazard. The ZQuiet comes with two mouthpieces, one with the lower jaw part slightly pushed forward, and the other with this same part extended even more. The former generally feels a bit more comfortable than the latter. The later tends to be more effective for people that snore more. It’s a popular option, no doubt in part due to its unique design and how comfortable it looks. Why am I allowing it to participate in my review of the best anti snoring mouthpieces of 2017? Because, technically, it does the same thing. It just follows a different method, which a lot of people actually prefer. The GMSS is one of my favorite anti snoring devices out there right now. Even when I don’t wear any mouthpieces, I sometimes experience a bit of jaw soreness because I have a cross bite and chew gum way too much. The GMSS does not attach to your jaw and so it doesn’t add to my jaw soreness at all. The GMSS goes outside of your teeth and behind your lips so that it doesn’t feel like you’re sleeping with anything in your mouth. This allows you to wear the device despite having crowns, bridges, or other dental implants. Zyppah is probably the coolest and most futuristic looking anti snoring mouthpieces I have seen so far. It features a neon green and black finish that almost makes you thing that it glows in the dark (it does not, unfortunately). Zyppah is actually a hybrid between a MAD and a TAD (an “MTAD“, if you will). It works by advancing your jaw forward while keeping your tongue in place with a restraining band. Pretty clever. The mouthpiece uses a boil and bite fitting method. This requires you to submerge the mouthpiece in boiling hot water sometime before taking it out, letting it cool, and biting into the mouthpiece so you create a good dental impression that perfectly fits your teeth. If you don’t get the fit right the first time, no worries, you can boil the mouthpiece again and try it a few more times. Like the ZQuiet and SnoreRx, it does have a mouth opening which allows you to breathe through your mouth while sleeping. 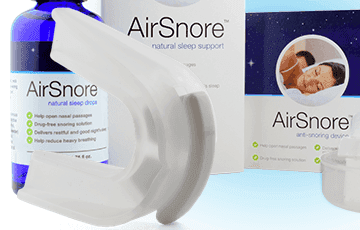 The AirSnore is one of the lower cost anti snoring mouthpieces in the market right now. It comes with a container of AirSnore natural drops. These drops can be applied to the chest, neck, or around the nose to help you breathe and sleep more easily. They contain a number of plant extracts such as Eucalyptus, Mentha Piperita, and Punussylvestris (I hope I spelled that right). One peculiar thing about the AirSnore device is that it advances the jaw forward very slightly. This does help make the device feel a bit more natural and decrease jaw soreness by a bit. That being said, the AirSnore only allows you to breathe through your mouth. This might be an issue for people with regular allergies or sinuses. However, for people with asthma, or other respiratory conditions, the AirSnore might make breathing more difficult because you will need to take bigger breaths. At first glance, all the crevices make the VitalSleep look a lot like those cheap vampire dentures I used to wear as a kid. Though they may look funny, these holes and crevices do not compromise the comfort of the mouthpiece at all! Te VitalSleep uses both a boil and bite mouthpiece fitting method and a calibration button that lets you adjust the device in small millimeter increments. Though it is generally considered one of the more comfortable anti snoring mouthpieces, the crevices do make cleaning a little more difficult than it is with other mouthpieces. However, using a denture cleaning tablet at brushing it with a toothbrush and paste will keep your VitalSleep clean as new. The hinges holding the VitalSleep together allow you to move your jaw sideways, which is something you cannot do with most other anti snoring devices. Overall, the VitalSleep gives you some of the best bang for your buck in the anti snoring mouthpiece world. The PureSleep is one of the most popular anti snoring mouthpieces around. It has appeared on tv channels like ABC and has been claimed to be the best selling snoring solution. It allows you to switch between three lower jaw settings so that you can find a comfortable and effective fit that works for you. Additionally, the PureSleep also uses the boil and bite fitting method. The PureSleep really tries to make sure that their product will work for their customer, because of this they have a 21 question questionnaire to help ensure that PureSleep is right for you. Though a bit annoying, this is actually a good thing because it helps prevent you from buying something might not work for you later. The company has a try it before you buy it option in which you only pay shipping costs upfront. If you decide you like it after your trial, you can then pay the full cost of the device. Hopefully, this guide has helped you clear up some questions about the best anti snoring mouthpieces. If you have any specific questions about any of these products in particular definitely let me know and I’ll be glad to help you out. I have family members who snore really loudly, but other than just annoying people, I never thought that there would be other more serious consequences for snoring. The anti snoring devices that you have reviewed look really professional and reliable. I would personally prefer the one that is designed to be attached to the tongue, because it doesn’t seem to be too bulky for a device that has to be put inside the mouth. Technology has gone a long way in helping people with their sleeping and snoring issues. I would say one of the most important things is that the device is comfortable. The best anti snoring mouthpieces all have high comfort in common. The Good Morning Snore Solution is definitely one of my favorite choices from this review because it is comfortable, effective, and non-invasive. If you try it out let me know how it goes! Man, I have been here before. My wife snores, and she’s used the nasal strips in the past. They work pretty well, but I’ve tried them when I had trouble breathing and found them pretty uncomfortable. Personally, I don’t like things in my mouth at night, either. I used to have to wear a mouth guard because I would grind my teeth (something else apparently quite annoying to one’s bed partner), and it drove me nuts. Maybe one of these will work for her since she doesn’t seem to have the same problems with these types of devices. Worth a shot! Yes, I’ve heard about the nasal strips but have never used them personally. I know most of these anti snoring mouthpieces have a pretty high success rate, but having something in your mouth while sleeping may not necessarily be the right move for a lot of people. If your wife is ok with the idea of this, then these one of these anti snoring mouthpieces will likely work for her. No problem Daniel, hope it helped. I actually have a snoring problem and I really would love to stop my snoring. It is good that it can be adjusted because I know many mouthpieces don’t have that. I do boxing training regularly and that adjustment issue can be a legit problem. These anti snoring mouthpieces do not really feel like your traditional sports mouth guards, they are generally more comfortable and most of them allow you to customize their fit to your teeth. Adjusting the mouthpiece is a big plus and that’s why the SnoreRX is such a popular option for people looking to stop snoring. Thanks for the great info. I am glad I come across you site and see what I am looking for. After almost a tragic accident, I started snoring about 10 year now. I tried so many anti snoring devices, but they can’t help. I see your your Puresleep really promising. Definitely want to try it out, I would like to know if they are safe for me because I have only a few teeth left after accident. Hi Maun, I’m glad you found the article helpful. The Puresleep is not recommended for people with certain teeth issues. To see if the product is safe for you, they have a 21 question questionnaire where they will ask you all the questions necessary to help them determine if Puresleep is right for you. I believe Puresleep will still work if you are missing a few teeth. Before you purchase the product, the site makes you fill out the 21 questions and after you’ve answered those to the best of your ability you will know whether or not the Puresleep anti snoring device is safe for you. Hi June, good to hear the post has been helpful for you! The SnoreRx allows for a custom fit of your sons teeth using the boil and bite teeth impression method in addition to allowing the mouthpiece to be adjusted in very small increments. It is normal for the teeth to feel sore during the first three to five days, but after that, the feeling should be gone. The soreness is commonly compared to the feeling of wearing braces at first. The SnoreRx is definitely one of the best anti snoring mouthpieces out there right now, so it could definitely help in treating your sons snoring problem. However, it’s possible that your son might have some degree of sleep apnea, meaning that the snoring might be causing him to be wake up multiple times throughout the night (unknowingly) and leading sleep deprived. CPAP can also be an extremely effective treatment if that is the case. You can read more about how CPAP works and sleep apnea in my post-> What is a Sleep Apnea Machine?- A Simple, Short, and Complete Guide. Great products since my husband snores a lot! But, for the good morning brand, when they say it has been known to fall out the mouth..do you know if it is because they sleep with their mouth open? IF so than would you say it wouldn’t be good for someone who snores with their mouth open? (like my husband lol). I would love to find a brand that can stay in the mouth for people that sleep this way. Hi Liz, great question. The Good Morning Snore Solution will work for people that snore with their mouth open. When using it, the tongue is sucked into the mouthpieces. The mouthpiece also creates a seal such that even if the lips are slightly opened, the mouth is technically still closed. Some people have said that the mouthpiece can fall out, but this is usually due to not having the device creating enough suction with the tongue. Adjusting the bulb to create more suction tends to fix the issue. I have an issue of snoring for years and my girlfriend and exs always complained about them! Opps! I have thought of removing my tonsils but I never gave any serious thought about it. I didn’t realized that there were products that prevent snoring from taking place and it is definitely interesting to see the wide range of products on this page. The SnoreRX (I read it as snorex from pokemon initially lol) sounds like a great tool to have! Just wondering will it cause major discomfort? Won’t it be harder to sleep if the user experience discomfort? As far as the discomfort goes, even the best anti snoring mouthpieces will create some degree of soreness and discomfort at first. However, after you’ve worn them for a couple of days (maybe two or three) the mouthpieces starts feeling more comfortable and you usually stop feeling sore. That being said, some of the lower tier anti snoring mouthpieces can cause constant soreness and discomfort. But those are usually the ones you see being sold for $10 with no FDA approval or any third party source of credibility. Well I’m absolutely amazed as to how many solutions there are to snoring. I do wonder how many snorers have even heard of some of these innovations. My son-in-law snores so heavily that he and my daughter sleep apart because she gets no sleep and has to work. I feel sorry for both of them. He is really upset that he keeps his wife awake and she is really sorry he has to sleep in another room. I will point them towards your webpage. You have really done a great job in going through all these anti snoring devices and picking out the pros and cons. Thanks for the comprehensive review. Hi ches, I have heard of that problem come up in many situations. That is one of the big things that these anti snoring devices can provide for people, allowing couples and people to sleep around each other with no worries about snoring keeping them up at night. Thank you very much for this great info, it sure will save lots of lives and marriages, lol. Recently, I found myself snoring heavily and both my partner and my little kid find it really uncomfortable sleeping once it starts as it can really get louder. I have never been someone to easily believe in these technologies but with your detail review here i might just have to go for one. Having decided to go for one, the issue of which to go for is another challenge and would appreciate if you can recommend one for me. Hi Clems, thank’s for checking out the post. These are some of the best anti snoring devices out there and so they’re all pretty good in my opinion. However, if I had to pick one to be the best I would say the Good Morning Snore Solution is one of my favorites for sure. It is not very intrusive and works a bit better in my case because of my slight cross-bite. Let me know if you have any questions on any more of them. Snoring is one of the most annoying things out there:) My husband isn’t a terrible snorer but some nights I just can’t get to sleep because that’s all I can hear. These solutions all look great but they also look rather uncomfortable. I never had braces but is it the same as wearing a retainer in the night? Hi Hollie, yes good observation. I thought the same thing the first time I saw one too. Truth is most of these anti snoring mouthpieces look deceptively uncomfortable. In reality they may be a bit uncomfortable the first time you ever wear one, but after the first few nights the feeling should go away. If it doesn’t, it might mean that it is time to try out a different anti snoring device or a different treatment method. Literally the best post I’ve seen since week! My boyfriend does NOT quit his snoring lol so surely i know what he’s getting for his birthday gift! I didnt even know mouth pieces for snoring existed so you’re really a savior. Peaceful sleeping nights await! My favorite is probably number 7 because it looks the smallest to me and I know he wouldnt want something too big and uncomfortable in his mouth while sleeping. thanks for such an excellent post! No problem Tiffani! I’m very glad it was useful for you. Hello Juvan – First of all I was amazed by this site, until now I never knew there are devices by using which we can reduce snoring. I really like to try ayleast one but I’m a beginner who is gonna use it and what would you suggest me? Hopefully this should reduce the nerves of person sleeping next me as I had lot of complaints from my friends on snoring 🙁 Thanks for this products review. Hi Manasir, I like the Good Morning Snore Solution because its not too invasive but still works. I like the SnoreRX also, it’s a very popular and well designed anti snoring mouthpiece. I had no idea that mouthpieces could be a solution to snoring problems, thanks for sharing. I will look into it and try it out as it is a problem for others around, but like you mentioned, it really affects the quality of sleep. I am not sure if I would feel comfortable sleeping with a mouthpiece. I want to try one out, which one would you recommend ? They are a bit scary at first but the ones in these posts are all safe to use. The most important requirement is to make sure they’re made from safe materials. As far as a mouthpiece I like the SnoreRX because it is adjustable and comfortable. However, the Good Morning Snore Solution is also a good choice because it’s not too invasive. hi this is a good article it want to know about if old man is snoring in night is that good or it a typically some kind of problem my uncle is doing so. It depends. Snoring is pretty common, although it does decrease sleep quality, by itself it doesn’t produce too many problems outside of the annoying sounds. However, sometimes snoring is a sign of sleep apnea, and when this is the case, it should be treated correspondingly as sleep apnea can have some very negative long term health effects. Great article, thanks for sharing. Great enjoyable and interesting read. My daughter and her fiance moved into their first home earlier this year, all excited but exhausted they retired to bed to get some much needed sleep but were awoken by neighbours knocking on the wall, shouting “Stop your snoring”! It kind of took the buzz off moving into their first mortgaged house! I bought this ring that her fiance (who was the one who was snoring) a ring to wear on his little finder, it was an anti-snoring ring to wear in bed. As a love and relationship specialist life coach and psychic I have a lot of ladies through complaining that their partners snoring is damaging their relationship – but now I can at least recommend this amazing anti-snoring ring! It was inexpensive too. Yay sleep at last we say! Hi Kaz. Sounds pretty interesting, I’ve never heard of anything like that but I’m curious to learn more. Would you mind sending me more info?